Note: This article describes how to manually create a user group. When using LDAP, user groups can be created automatically (see LDAP integration). Note: All names and log-in names of users are all mutually exclusive (meaning: you cannot use a name for a user group if that name is already used for a user account). 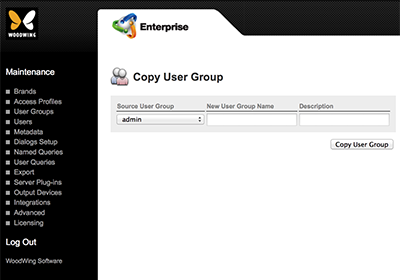 Enterprise will warn you if you try to create users with the same name as a user group or vice versa. You may want to plan in advance how to name your users and/or user groups. Step 1. Access the Overview of User Groups page. 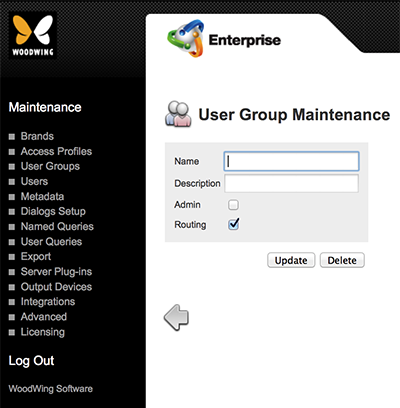 In the Maintenance menu or on the Home page, click User Groups. A page showing all created user groups appears. 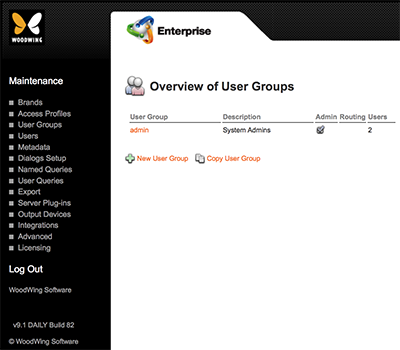 Figure: The Overview of User Groups page shows all created user groups. Step 2. Click New User Group. The User Group Maintenance page appears. 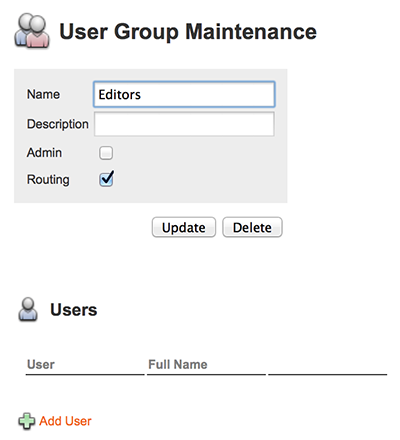 Figure: The User Group Maintenance page is used for setting up the user group. Name. Name of the user group. Must be unique with respect to other groups and user names. Note: User group names can be up to 63 characters long (including special characters — for example numerals or other non-alphabetical ASCII characters such as hyphens, dots, and underscores). Description. A description of the group. This will appear on the Overview of User Groups page and will help you in identifying the purpose of the group. Admin. Select this if the users in this group need to access the Maintenance applications to control users, user groups, and Brands, as well as view files that are set to the Personal state. Routing. Set this if it should be possible for users to route files to the group. The user group is added to the system and a section appears at the bottom of the page for adding users to the group. Figure: After clicking Update, the Users section appears. See Adding a user to a group below. When you need to create a new user group with settings that are identical to an already existing group you can create a copy of that group to use as a starting point. Step 2. Click Copy User Group. The Copy User Group page appears. Figure: The Copy User Group page is used for creating a new group based on settings of an existing group. Step 2. From the Source User Group list, choose the group that needs to be copied. Step 3. In the New User Group Name box, enter a name for the new user group. Step 4. (Optional) In the Description box, enter a description. This will appear on the Overview of User Groups page and will help you in identifying the purpose of the group. Step 5. Click Copy User Group. The User Group Maintenance page for the new group appears. Step 2. Click on the name of the user group in the User Group column. The User Group Maintenance page for that group appears. Step 3. Make the necessary changes. Adding a user account to a user group can be done from the user account or from the user group account. In the Maintenance menu or on the Home page, click Groups. A page showing all created user groups appears. Step 3. In the User Groups section, click Add User. A page appears with a list containing all users which do not yet belong to the group. Step 4. Select one or more users. The user is added to the user group and the User Group Maintenance page appears again, with the added user(s) included in the Users list. Step 1. Access the Overview of Users page. In the Maintenance menu or on the Home page, click Users. A page showing all created user accounts appears. Step 2. Click on the name of the user in the User column. The User Maintenance page for that user appears. Step 3. In the User Groups section, click Add. A page appears with a list containing all groups to which the user does not yet belong. Step 4. Select one or more user groups. The user is added to the user group(s) and the User Maintenance page appears again, with the added user groups included in the User Groups list. Step 2. In the User Group column, click on the name of the user group from which a user account needs to be removed. Step 2. In the Users section, click Delete next to the User Name of the user that needs to be removed. Step 3. Click OK to remove the user from the user group. Note: Instead of deleting a user group, it can sometimes be preferable to remove all users from the user group instead. Step 2. In the User Group column, click on the name of the user group that needs to be removed. Step 4. Click OK to remove the user group. The Overview of User Groups page appears with the user group removed from the list.